Covering best practices, current trends, and the latest technology, the fifth edition features new and revised material on: succession planning for small businesses and nonprofits; replacement planning; transition management; downsizing; international issues; mergers and acquisitions as a talent strategy; and succession planning for technical positions as well as roles built on longstanding social relationships. 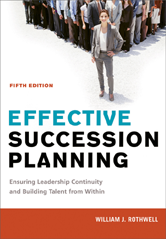 Chapter 1 What Is Succession Planning and Management? Six Ministudies: Can You Solve These Succession Problems? Which Comes First, Talent or Strategy? The Most Famous Question in Succession: To Tell or Not to Tell? Management Succession Planning, Technical Succession Planning, or Social Network Succession Planning: What Are You Planning For? What Does All This Mean for Succession Planning and Management? Integrating Whole Systems Transformational Change and Appreciative Inquiry into Succession: What Are These Topics, and What Added Value Do They Bring? How Are Competencies Used in Succession Planning and Management? What's the Focus: Management or Technical Competencies? What Are Values, and What Is Values Clarification? How Are Values Used in Succession Planning and Management? What Are Ethics, and How Are Ethics Used in SP&M? Are There Other Ways to Think of Potential Assessment? When Should Recruitment Be Used to Source Talent? What Is Retention, and Why Is It Important? What Common Misconceptions Exist in Managing Retention Issues? What Specialized Competencies Do Succession Planning and Management Coordinators Need to Use These Applications? What Metrics Should Be Used to Evaluate Succession Planning and Management Programs? How Should Evaluation Be Conducted? How Can Succession Planning and Talent Management Be Evaluated with the Balanced Scorecard and HR Dashboards?